Senior BC Hydro officials have quietly feared for years that earthquakes triggered by natural gas industry fracking operations could damage its Peace River dams, putting hundreds if not thousands of people at risk should the dams fail. Yet the Crown corporation has said nothing publicly about its concerns, opting instead to negotiate behind the scenes with the provincial energy industry regulator, the BC Oil and Gas Commission (OGC). Fracking could trigger earthquakes more powerful than some of [BC Hydro’s] dams are designed to withstand. To date, those discussions have resulted in only modest “understandings” between the hydro provider and the OGC that would see a halt in the issuance of any new “subsurface rights” allowing companies to drill and frack for natural gas within five kilometres of the Peace River’s two existing dams or an approved third dam on the river, the controversial $9-billion Site C project. Companies already holding such rights, however, would not be subject to the ban. But once again, none of this is public knowledge. Only after the Canadian Centre for Policy Alternatives filed a Freedom of Information request with BC Hydro did the Crown corporation disclose its concerns, which focus on the possibility that fracking could trigger earthquakes more powerful than some of its dams are designed to withstand. Documents released by the Crown corporation under the FOI show that in December 2009 senior officials at BC Hydro became alarmed at oil and gas industry operations on lands near its Peace Canyon Dam. The dam is 23 kilometres downstream from the W.A.C. Bennett Dam, a 49-year-old structure that impounds the world’s seventh-largest hydro reservoir by water volume. Of concern was an experiment underway to extract methane gas from coal seams in proximity to the Peace River. Coal bed methane extraction had never before been tried in B.C., although it had been done extensively in several U.S. states and in Alberta with sometimes disastrous results, including instances of water so badly contaminated with gas that people could set their household tap water on fire. In December 2009 senior officials at BC Hydro became alarmed at oil and gas industry operations on lands near its Peace Canyon Dam. To extract such gas, companies drill into relatively shallow coal seams and then pressure-pump immense amounts of water into wellbores in fracking operations. Fracking creates cracks or fractures in the coal seams that allow trapped gas to be released. Typically, companies then “de-saturate” or de-water the sites by pumping water out so the gas can flow. At the time, Hudson’s Hope Gas, a subsidiary of Canada Energy Partners and GeoMet Inc., had drilled at least eight coal bed methane wells near the community of Hudson’s Hope, which lies about nine kilometres downstream of the Peace Canyon Dam and is home to more than 1,000 people. The company had plans to drill and frack up to 300 more wells, with at least three of those wells situated close to the Peace Canyon Dam. The plans clearly alarmed BC Hydro’s then chief safety, health and environment officer, Ray Stewart, who called them an “immediate” threat to the region’s hydro facilities. “The production of coal bed methane from these wells involves hydro-fracturing [fracking] to increase permeability of the coal seams, followed by extraction of groundwater to de-saturate coal seams and allow methane gas to be released,” Stewart noted in a letter to the provincial Ministry of Environment’s Glen Davidson, then British Columbia’s comptroller of water rights. Stewart went on to warn that the “potential effects” of such actions could be natural gas industry-induced earthquakes that were greater in magnitude “than the original design criteria for the dam.” What risks this posed to people and communities immediately downstream of the dam, he did not say. Stewart also warned that fracking could “reactivate” ancient faults in the region, which could potentially set the stage for earthquakes. He also warned of unspecified “hydrogeologic impacts” on hydro reservoirs from fracking and the potential for site-specific areas of land to subside or sink as a result of immense amounts of water being pumped out of the earth or in the event that de-watered coal seams somehow ignited. There are no further such letters from Stewart in the documents supplied by BC Hydro. Part of the reason for that may be that coal bed methane extraction was a short-lived phenomenon in B.C. No company in the Peace region or anywhere else in the province for that matter is currently drilling or fracking for such gas. However, no sooner had natural gas companies dropped their pursuit of coal bed methane than they turned to another so-called “unconventional” fossil fuel – shale gas. The Montney Basin, which underlies much of the Peace River region, is rich in shale gas. But extracting shale gas, which is tightly bound up in rock formations, requires the use of even greater brute force fracking technology. More water must be pumped at even higher pressure to fracture the rock and extract the trapped gas than is the case with coal bed methane, which is typically found closer to the earth’s surface. As fracking for shale gas became more common, senior officials at BC Hydro began to see a pattern. Earthquakes started occurring in lockstep with fracking operations. As fracking for shale gas became more common, senior officials at BC Hydro began to see a pattern. Earthquakes started occurring in lockstep with fracking operations. One of the most pronounced examples occurred in the Farrell Creek fracking zone, near BC Hydro’s Peace River dams. Between July 2010 and March 2013, a dozen earthquakes were recorded in the region, ranging from a low of 1.6 magnitude on the Richter scale to a high of 3.4. The cluster of earthquakes, all in roughly the same confined region where one company, Talisman Energy, was involved in extensive fracking operations, caught the attention of Scott Gilliss, BC Hydro’s dam safety engineer in the Peace River region. Gilliss made his concerns known to senior officials at head office. Shortly after that, he received an email from Des Hartford, Hydro’s principal engineering scientist, who reported directly to Stephen Rigbey, the corporation’s director of dam safety. Gilliss did so, pointing out in a subsequent email released by BC Hydro that “oil and gas production may have contributed to a dam breach” at the Baldwin Hill Dam in Los Angeles in 1963. A subsequent review of the catastrophe by Richard Meehan, a leading expert on fluid migration at Stanford University, and Douglas Hamilton, a prominent civil engineer, concluded that “fluid injection” by the oil and gas industry, combined with sinking ground around the dam had led to the structure’s sudden and ultimately deadly failure. Gilliss ended his letter on a note of exasperation. Gilliss’s buffer zone idea was by no means new. Two years earlier, after conducting research for the Canadian Centre for Policy Alternatives, I had authored a report calling for “no-go zones” where fracking was prohibited to protect other important resources such as water. By then, there were also de facto bans on fracking in Quebec and New York State. After writing his email, Gilliss and other top BC Hydro officials had even more reason to think that no-go zones made sense. More and more earthquakes in northeast B.C. were being triggered by fracking, including a magnitude 4.6 tremor that occurred to the north of Fort St. John last year. It was in an area then being actively fracked by Progress Energy, a subsidiary of Malaysian state-owned Petronas. The strength of that induced earthquake was the largest to date anywhere in the world associated with fracking operations. Petronas is behind a controversial proposal to build a massive Liquefied Natural Gas or LNG terminal at Lelu Island near Prince Rupert. The raw gas for the plant would come almost entirely from northeast B.C., including the Peace River area, and would have to be fracked to be produced. This fact has led some people who oppose the project to refer to it not as an LNG project but an LFG or Liquefied Fracked Gas project. At least some of that gas would come from lands adjacent to what could one day be a new 83-kilometre-long reservoir impounded by the Site C Dam. 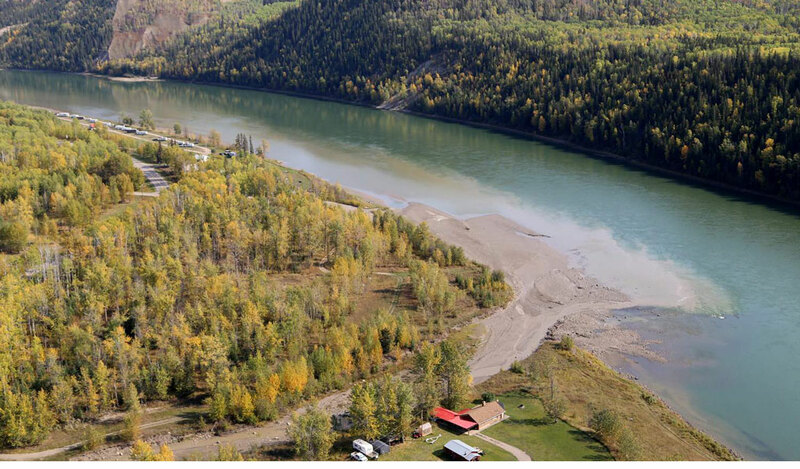 Like the upstream Bennett Dam, Site C would be an earth-filled dam. The Bennett dam, completed in 1967, is now almost exactly halfway through its projected 100-year operating life. At nearly two kilometres across and the height of a 60-storey building, it is one of the largest earth-filled dams in North America. In 1996, it became the subject of intense engineering and safety scrutiny when two sinkholes suddenly opened at the crest of the dam. In an investigative magazine article written a few years after that discovery, writer Anne Mullens noted that were the dam to fail, it would unleash a torrent of water so powerful that it would wipe out the Peace Canyon dam downstream, sending an “unstoppable burst of water 135 metres high,” down on the residents of Hudson’s Hope and communities much farther downstream. Writer Anne Mullens noted that were the dam to fail, it would unleash a torrent of water so powerful that it would wipe out the Peace Canyon dam downstream, sending an “unstoppable burst of water 135 metres high,” down on the residents of Hudson’s Hope and communities much farther downstream. In an interview following the release of the FOI materials, Rigbey said that Gilliss and other dam safety officials operating in the field are paid to worry, but that he himself has no concerns that fracking operations would trigger any catastrophic failure at BC Hydro’s Peace River dams. Rigbey did say, however, that ground motions from fracking operations could cause slight alterations to “weak bedrock” near the dams and that in turn could change the way that water naturally seeps through earth-filled dams. Ground motions could also potentially knock some electrical control equipment off-line, Rigbey added. In the event that one or both happened, BC Hydro would be faced with high repair and maintenance costs. “Would it [fracking] bring the dam down? Not a hope. Would it do damage and cost me a lot of money? Absolutely. It would cost me a lot of time and a lot of money and that’s what I don’t want to occur,” Rigbey said. Rigbey said that for these reasons BC Hydro has sought to exclude fracking from zones nearby the Bennett and Peace Canyon dams and around the construction zone of the Site C dam. In an interview following the release of the FOI materials, [BC Hydro’s director of dam safety Stephen] Rigbey said that Gilliss and other dam safety officials operating in the field are paid to worry. Currie added that the proposed Site C dam falls within the Montney shale gas zone, one of the most actively drilled and fracked zones in the province. The email fails to mention that such protective measures do not prevent fracking-induced earthquakes. Cement casings, which are often imperfectly poured and prone to fail, are intended to prevent groundwater from being contaminated – an entirely different issue. The “understanding” between Hydro and the OGC does not extend to the lands around the reservoirs themselves, Currie said. That includes lands around what could one day be the Site C reservoir; lands that according to a document prepared for BC Hydro could experience as many as 4,000 landslides during and after the reservoir fills. Whether or not fracking could further destabilize those lands damaging the reservoir and dam itself remains unknown. What is known, however, is that earthquakes induced by fracking behave entirely differently than do naturally-occurring earthquakes. Gail Atkinson is a professor in Earth Sciences, a leading expert on the effects of induced earthquakes, and holds the Industrial Chair in Hazards from Induced Seismicity at the University of Western Ontario. The chair is funded, in part, by TransAlta, a privately owned hydro provider in Alberta. “The concern is that the potential for induced earthquakes to generate strong motions makes it difficult to satisfy the high safety requirements for critical infrastructure, if earthquakes can be induced by operations in very close proximity [to dams and reservoirs],” Atkinson said. In a telephone interview, Rigbey said he agreed with Atkinson’s thinking that both firm no-fracking buffer zones and special management zones beyond that made sense. 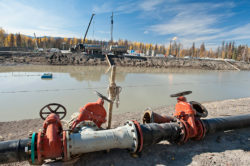 Atkinson’s thinking is in keeping with ongoing efforts by TransAlta to protect some of its hydro facilities in Alberta from natural gas industry fracking operations. Those efforts appear to have effectively shut down fracking in a buffer zone around one of TransAlta’s dams and the dam’s reservoir as well. Special operating guidelines are also in place beyond the buffer zones that can force companies to cease fracking. But, as is the case in B.C., negotiations between TransAlta and Alberta’s energy industry regulator have happened behind closed doors. Members of the public who are at direct risk should a catastrophic dam failure occur are kept in the dark when it comes to negotiations that could have a direct impact on their lives. Tomorrow: Alberta’s advances and questions about why B.C. may be lagging behind. This post is also available via DeSmog Canada and The Tyee.